Have you tried nail strips? Being a self-confessed nail art addict, I had been wanting to try these for a long time, but for some reason, I haven’t until this week, when I received two kits of NAIL DRESS MIX IT UP from KISS. They are pressure-sensitive adhesive that you apply on clean and dry nails to dress them with fun patterns and textures. Looking for a statement accessory? Try statement nails! They’re easier to applier than I thought and easy to peel off, without any damaging acetone (hooray!). Mine lasted about a week (way longer than I thought in the first place! ), but if you have an important event, I suggest you apply them the night before, to make sure they look their very best. Each kit contains two different designs (perfect to mix and match) and includes 40 strips (in 12 different sizes) and a nail file! You will find them at any Target store for less than $10! Have I told you how happy I am that Target finally opened up in Canada? Ta-daaa! You’re ready to rock your manicure! I’m wearing the golden ones from the Daiquiri pack (first photo) and Tania is wearing the Cosmopolitan, in the lightest shade (second photo). See those products here. Are you going to try those? 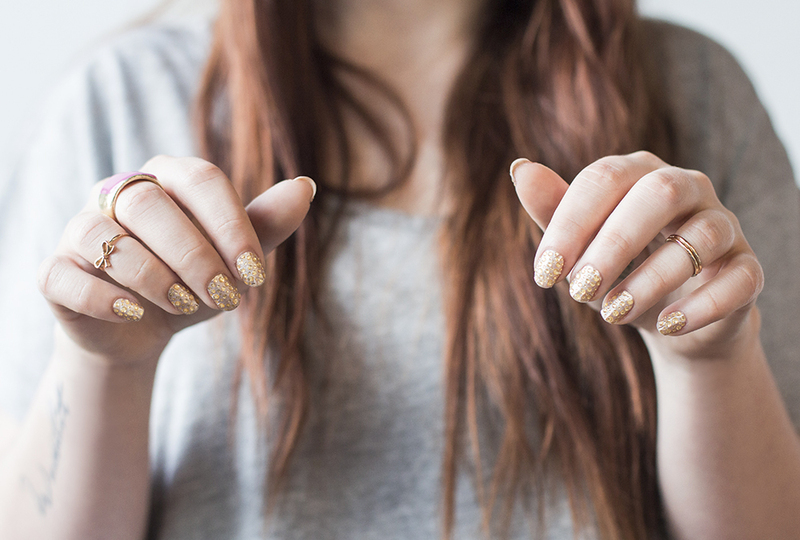 Where would you rock such a cool manicure? Notify me of followup comments via e-mail. You can also <a href='http://coloursandbeyond.com/comment-subscriptions?srp=5204&srk=&sra=s&srsrc=f'>subscribe</a> without commenting.